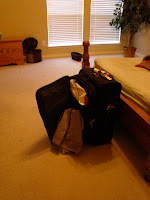 So we are going to see how long this particular suitcase sits in the bedroom. For the record, I pulled out the dirty clothes and washed them. The clean clothes are on him to put up! Come on, put the clothes up. He deserves a little help--it is hard being gone from home away from the one he loves--Chase, I mean you. If you out wait him, the movers may have to put them up in 20 years when you guys move!